Amid the renovation of City Hall, the remodelled King George Square is undergoing some enhancement too. Recently some mature trees were planted in an attempt to soften the area and also provide some much needed shade. Negative comments from residents have abounded since the new Square was opened, and much has been said about the heat and glare reflecting up from the paved surface. I don't know why it is that Joe Blow can spot these deficiencies in public works, but well-paid architects and engineers seemingly cannot. Meanwhile, some old friends have returned too. The group of three statues known as Speakers' Corner has been replaced in the Square. Here is a recent photograph of the trio. 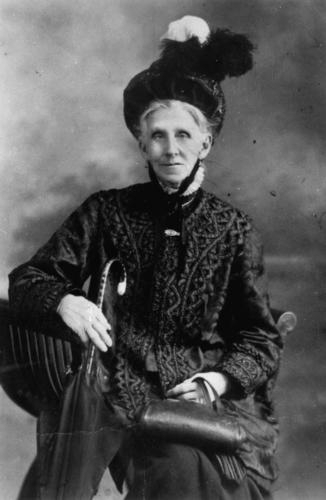 Emma Miller, pictured below, emigrated to Brisbane from England in 1879. She was a seamstress who was employed to make shirts in Brisbane. She was instrumental in the formation of a female workers' union, and a campaigner for "one adult, one vote", a movement that sought the vote for women and the cessation of multiple votes for squatters. Emma Miller led a group of female workers on a protest march to Parliament House on the Black Friday of the general strike in 1912. When she died in 1917, the flags at Trades Hall were flown at half-mast. Sir Charles Lilley was a prominent lawyer and newspaper proprietor who became a politician and then a judge. He arrived in Brisbane in 1856 from England, and after joining the bar, became a QC in 1861. He also bought an interest in the local newspaper, the Moreton Bay Courier. After his marriage to Sarah Jane, the daughter of Joshua Jeays, he lived for a time in Joshua Jeays' Bardon House. 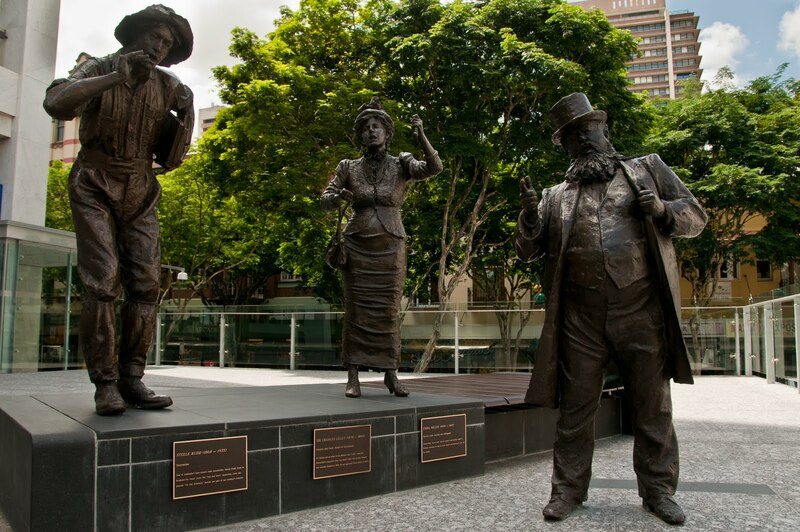 He stood for and won the seat of Fortitude Valley in Queensland's first Legislative Assembly in 1860, to become known as "Lilley of the Valley". He was premier of the state from November 1868 to May 1870, remaining in the parliament until 1874 when he accepted a position on the bench. Lilley became Chief Justice in 1879, and he was knighted in 1881. 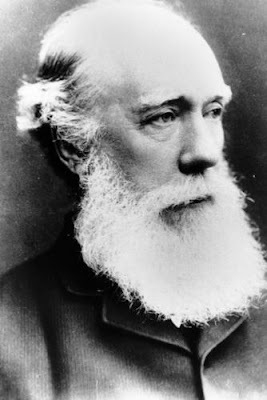 He retired from the bench in 1892, following the decision of the Full Court to reverse a decision made by Lilley in a trial in which his son, a barrister, had been engaged. Sir Charles Lilley died in 1897, and is buried on the most prominent hill in Toowong Cemetery. 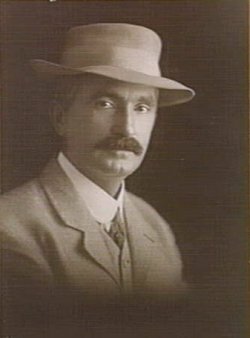 Here is a portrait of him, taken in his later years. I remember seeing these statues in the old square. I had wondered where they had gone. Great to see them back. Tho do they still have the plaque informing us about Emma Miller's umbrella and when it was broken off? Sad to see that her statue was never repaired. I didn't see any plaque there about an umbrella. I assume workers in the CBD like having their sandwiches in the square in summer - I certainly do in our Melbourne equivalent. So heat and glare reflecting up from the paved surface would be extremely unpleasant. I would take the architects and engineers from the town hall and make them eat their sandwiches in the heat and glare. That would focus their attention. That's right Hels. The square was once a green and soft welcoming space that could be enjoyed at all times of the year.